Educators from Hollenbeck Middle School in Boyle Heights, Los Angeles chant, "Teachers united will never be defeated!" in front of their school. Updated Monday at 10:16 a.m.ET. Los Angeles public school teachers went on strike Monday morning, a result of failed negotiations between the teachers union and the school district. The strike has looked inevitable since Friday, when United Teachers Los Angeles rejected another offer from district leaders. "We are more convinced than ever that the district won't move without a strike," declared union President Alex Caputo-Pearl at a Sunday press conference. UTLA has more than 30,000 members, including teachers, librarians, school nurses and counselors. The last time the city saw a teacher strike was nearly 30 years ago. The district says schools will remain open for the same hours during the strike, with the same before- and after-school programs. It has also said that student learning will still take place in schools staffed by administrators, volunteers and 400 newly hired substitute teachers. 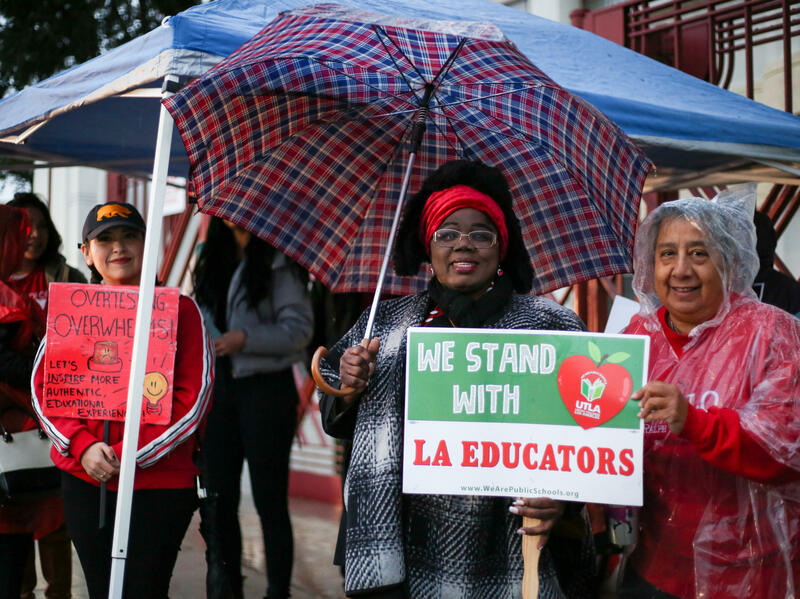 Negotiations with the LA Unified School District started in early 2017, and union members have been working without a contract for more than a year. LAUSD is the second largest school district in the nation, and the strike will affect about 480,000 students. 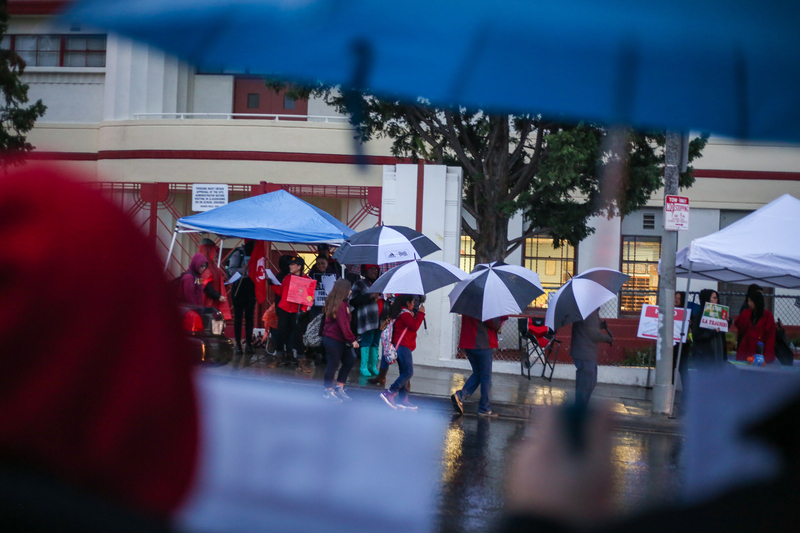 Rain or shine, the LA teacher strike has begun. The district and the union are close on teacher salaries, but educators and union leaders say the strike is about more than paychecks. "It's about the conditions that the kids are learning in," says Scout Wodehouse, a drama teacher at Orthopaedic Hospital Medical Magnet High School in downtown LA. On Thursday, California Gov. Gavin Newsom announced a proposed budget that includes more funding for public education. The next day, LAUSD presented a new offer that put more money toward the union's demands — but union leaders said the offer wasn't enough. They want smaller class sizes, more counselors and librarians, and a full-time nurse in every school. "If they want a strike, they'll have a strike," said LAUSD Superintendent Austin Beutner at a Friday press conference after unveiling the district's new offer. "We're doing everything we can to avoid it. We don't want it because we know the harm it will cause." Schools across the district informed parents of their plans during the strike, with several noting that kids should bring an extra book to read. According to a letter sent to parents at Walter Reed Middle School in North Hollywood, students will rotate through three subject blocks — English, math and physical education. The Los Angeles Times reports that Katherine Johnson STEM Academy, in the Westchester neighborhood, plans to have students work on district-issued Chromebooks. About 81 percent of LA's public school students receive free- or reduced-price meals, and schools will continue to serve those as well. The district's students are 73 percent Latino, 11 percent white, 8 percent African-American, 4 percent Asian and 4 percent other, according to data for the 2017-18 school year. It's unclear how many students will still attend classes. That number matters to LAUSD because the state funds schools based on how many students actually show up each day. Even a short strike will likely be expensive for the district.